In the creative world, there is one sin that is reviled above all others – selling out. But just what is a struggling auteur filmmaker to do in these crazy times of blockbusters and bottom lines to make sure his film is still seen? Heck, how is he even going to get his quirky little movie made for that matter considering the mounting cost of the supposedly independent film? Well, he could give up a tiny bit of creative control and allow a little product placement into his latest oeuvre, but how would he even know how to get to hell if he decided to shake hands with the devil? 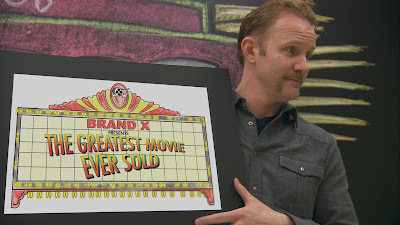 Enter Morgan Spurlock; the infamous documentary filmmaker recently made his latest film on location in hell and he can tell you just how you can buy in before selling out. “If you’re going to make a big movie,” Spurlock tells me over the phone, immediately following the Canadian premiere of his third documentary feature, POM WONDERFUL PRESENTS THE GREATEST MOVIE EVER SOLD at the prestigious HotDocs Canadian International Documentary Festival in Toronto, “you need all these promotional partners to drive awareness, to create a mentality around the movie, to make it bigger than life. We bought into this whole idea.” With this in mind, Spurlock set out to make what he calls the IRON MAN of documentaries, coining the term, “docbuster”. For those of you unfamiliar with any reason corporations might be hesitant to work with Spurlock, you have clearly not seen SUPER SIZE ME. The 2004 Academy Award nominated documentary put Spurlock front in center as the face of the film and found him embarking on a McDonald’s only diet for 30 days. His intent was not to lambaste the fast food giant but rather to look at the health issues associated with an all fast food diet. Regardless, the damage to one specific brand was fairly clear and Spurlock was subsequently branded himself, as an anti-establishment troublemaker. Once upon a time, it was only known as THE GREATEST MOVIE EVER SOLD. The brand above the title would depend on which company was willing to shell out the top buy in price of $1 million. 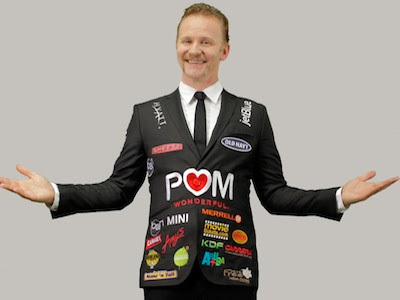 Spurlock contacted hundreds of companies to obtain sponsorship partnering for the film but would only have successful conversations with about 3% of those. “Ultimately we had to reevaluate every day as to why we were doing this,” he confides without any hesitation. “People would say there is no way we are going to let you super size our business like you did that other company.” Abercrombie & Fitch actually asked if they had to spell out to him why he wasn’t the appropriate half-naked body, I mean, face to represent them. Ouch. 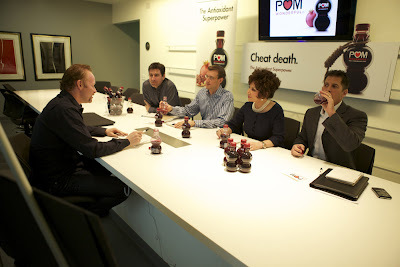 Spurlock did manage to snag a grand total of 22 sponsors, including major sponsor, POM Wonderful – hence the name above the title of the film. Other sponsors include Old Navy, JetBlue and Sheetz, an American convenience store chain that would get Spurlock’s face on collectible soft drink cups, a first for any documentary. Obtaining those contracts make up the first part of the film and, while accomplishing this goal was difficult enough, what would follow would seem even more insurmountable. Getting in bed with commercial sponsors, which is where every penny of financing for this film came from, means meeting the demands they make in exchange for their large financing contributions. Sure, Spurlock could fly around the country courtesy of JetBlue and could stay at Hyatt’s wherever he went but that meant he had to include actual commercial spots he made himself for these companies in the finished product. And how is this not selling out exactly? Money well spent, POM Wonderful, money well spent.